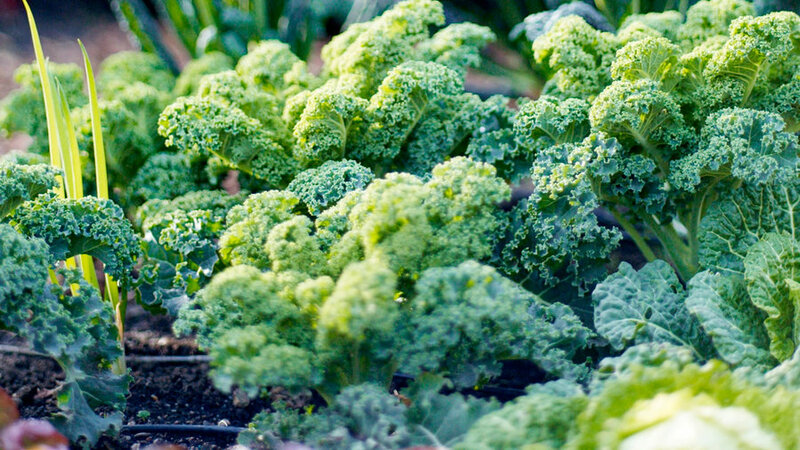 Plant kale in late summer for harvesting through fall and winter (in mild climates). 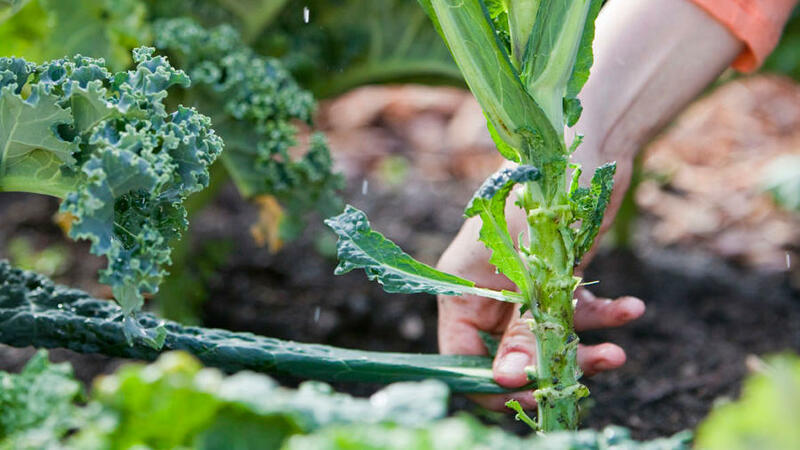 In cool summer areas, kale can be planted in early spring for a summer crop or grown for multiple seasons as a perennial. 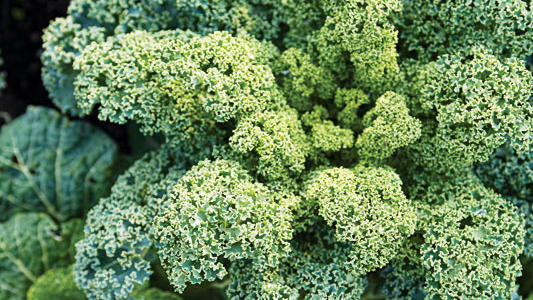 In all climates, kale grows best in full sun and with enough water to keep soil moist. Space seedlings 1 ½- 3 feet apart and plant in rich, well-draining soil. Sow seeds in place and then thin to the same spacing as seedlings after 4 weeks. Curly-leafed kales, such as ‘Winterbor’ (pictured) and ‘Redbor’ form compact rosettes with highly ruffled leaves. 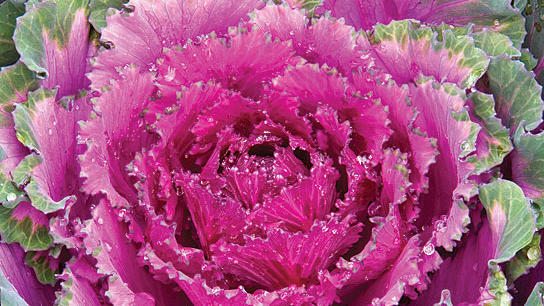 They are particularly vigorous growers, pest-resistant, and can withstand temperatures as low as 5°F / -15°C. Leaves become sweeter after a frost. Non-curly varieties such as ‘Toscano’ (also called “Tuscan,” “Lacinato,” or “dinosaur kale”) are favorites for salads and soups for their mild flavor. ‘Toscano’ grows upright up to 30 inches tall and can double as striking ornamental in a garden bed. 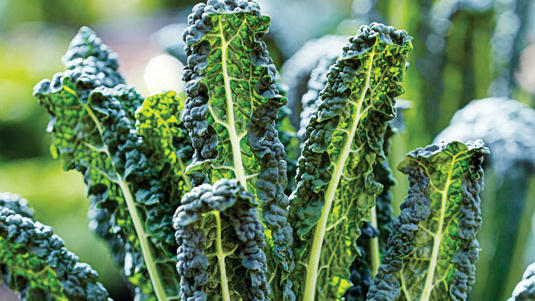 For all kale varieties, harvest outer leaves to encourage new growth. If picking by hand, hold a leaf at the base of the stem and pull downwards for a clean break from the stalk. With by-pass pruners or a kitchen scissors, cut leaves where they interest with the stalk. Save smaller, more tender leaves for eating raw in salads and set aside larger ones to steam, stir-fry, or add to stews.